Messier 81 is a spiral galaxy in the constellation Ursa Major. 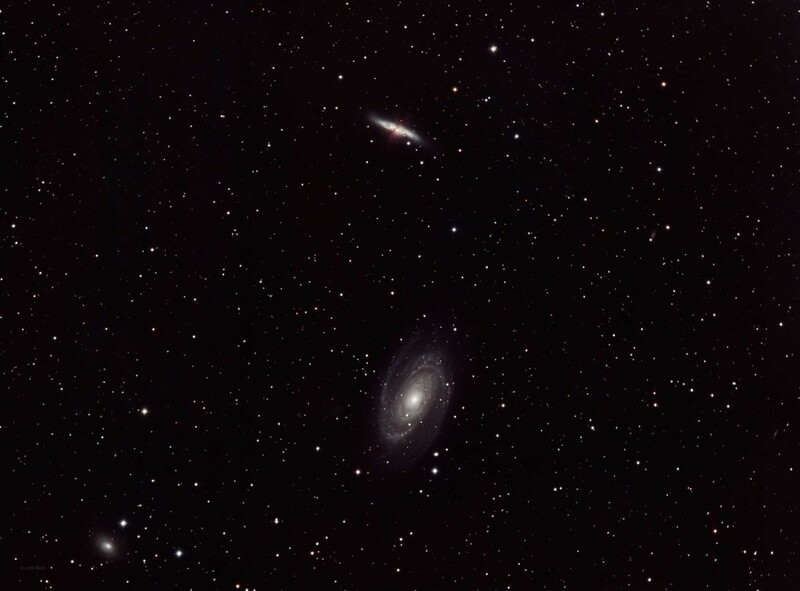 M81 is the larger galaxy at the bottom of my picture and is about 12 million light years away. With a diameter of 70,000 light years and at magnitude 6.9 it is one of the brighter galaxies and shows well in short exposures. M81 also contains a super massive black hole at its core that is about 15 times larger in mass than the one in our galaxy. The core itself is much larger than the core of our galaxy and contains many older reddish color stars. The spiral arms contain large amounts of dust and gas and are active star formation regions with young blue stars that give their arms their color. Messier 82 is a spiral galaxy type known as a star burst galaxy in the constellation Ursa Major. M82 is the smaller galaxy directly above M81 and also lies about 12 million light years away. A star burst galaxy is a galaxy that has had a gravitational interaction with another galaxy. In this case it was with M81 several hundred million years ago with the two galaxies presently about 150,000 light years apart. The area above and below the core show these starburst areas and appear as if they are exploding out and away from the galaxy core. Their reddish color and several dust lanes stand out from the rest of the bright galaxy. The Hubble Space Telescope has discovered over 100 young globular clusters in this galaxy and this was probably the result of the interaction with M81 several hundred million years ago. M81 and M82 are part of the M81 galaxy group that also includes 32 other galaxies located in the constellations Ursa Major and Camelopardalis. There is another galaxy that is also interacting gravitationally with M81 called NGC 3077. It is thought that NGC 3077 is partially responsible for the star development in M81. NGC 3077 is the fuzzy galaxy in the lower left corner of my image.